You may think that you're a clever subversive, plotting to wreak mayhem at the Olympic Games. But you didn't count on the Glorious People's Scooter Police. Hands up, terrorist dogs! Hey, no fair fleeing over that slightly uneven terrain! Come back here! Mao says: "Power comes from the back of a loaded Segway." Chinese elite anti-terror police officers are wheeling into action ahead of next month's Beijing Olympics on two-wheeled scooters. 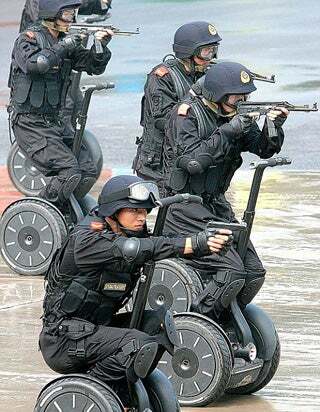 Members of the country's armed police unit practised on the Segway models that have been re-named 'Anti-Terror Assault Vehicles' in the eastern province of Shandong. In one drill, police posing as terrorists held ten badminton audience members hostage, 'shooting dead' four 'hijackers', capturing two and defusing a mock car bomb. Note to badminton terrorists: Just give up now. China has all the bases covered. And just in case, the team also have a secret weapon.